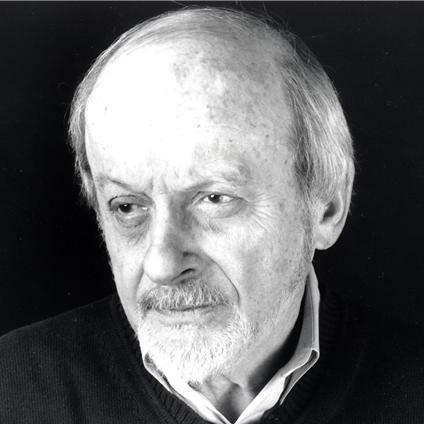 E. L. Doctorow, one of the giants of contemporary literature has passed. I have read nine of his twelve books, a ratio and record I have equaled in passion and loyalty with only two other contemporary authors, John Irving and J. K. Rowling. I intend to catch up with those three as of yet unread Doctorow books (I love books but I am not a voracious reader and my “want-to-read” list only keeps growing…). E. L. Doctorow’s most famous work, “Ragtime”, was the first “grown-up” book I read. I was either ten or eleven years old when I picked up my parents’ already well-worn paperback edition. I was enthralled by the sprawling historical fiction that mixed historical and imagined characters and events in a glorious literary melting pot. The prose was intelligent and the storytelling complex, yet the language was not only deceptively easy to read, it practically pulled me along. I wasn’t following the text, it was taking me along on a ride. And what a ride! Such a sprawling epic of the beginning of the American 20th Century, full of colorful, diverse characters and incidents! As such Ragtime made an excellent introduction to sophisticated adult literature for a boy who was a casual book reader at best. I quickly moved on to Doctorow’s debut novel, the wry western “Welcome to Hard Times”, and then hit a wall when I attempted “The Book of Daniel”. Here Doctorow’s prose changed completely. It was too dense and difficult for me at that age. I learned that Doctorow was a writer who would change literary styles and voices for each novel, sometimes quite dramatically. His most popular historical novels like Ragtime or The March or World’s Fair are written in beautiful prose that effortlessly draws you in to a richly told tale. Loon Lake’s prose, like The Book of Daniel, was tougher and dense. City of God made heavy intellectual demands, changing literary styles again and again within itself. 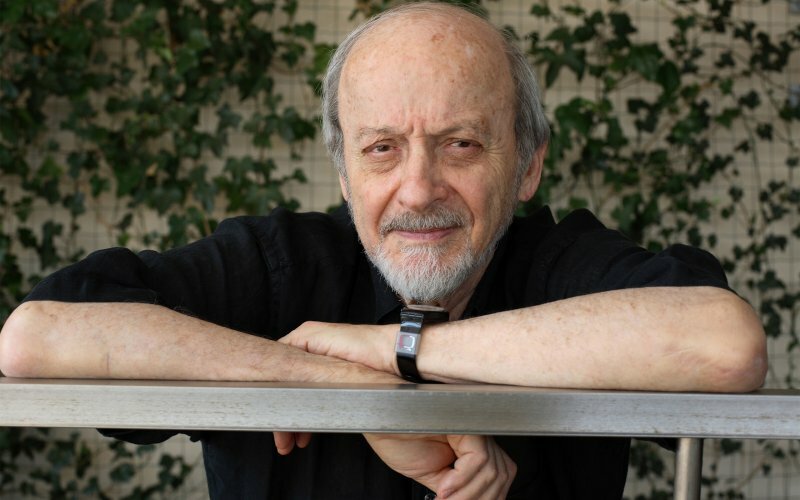 My most sensually delightful experience with E. L. Doctorow was reading Billy Bathgate. Billy Bathgate has sentences that stretch out over half a page; but instead of losing the thread of the thought as I might with other writers’ over-long constructions, reading Doctorow’s Billy Bathgate sentences was like swimming along in a delicious stream of thick and smooth honey mead. I’m not kidding, it really felt that visceral to me. But Ragtime will probably always remain my favorite E. L. Doctorow novel, understandable considering the impact it had on me at a young age. I actually haven’t reread it yet since then (perhaps I should or perhaps I should not mess with the childhood memory). I did see the movie version and the musical adaptation. I remember my parents and me being disappointed with the movie Ragtime. Perhaps unconnected to the novel it would be a fine movie, but I remember how jarring it felt to see whole lead characters and story lines from the book excised while minor characters and incidents from the book took up huge amounts of screen time. 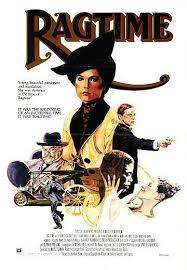 The movie Ragtime took elements from the book but didn’t capture its scope or point of view. Granting how difficult it may be to adapt a sprawling historical novel for the screen successfully, it is probably even harder to do so for the musical stage. But the musical Ragtime succeeds where the movie doesn’t, translating the stories and the scope and the ideas of the novel brilliantly for the stage. 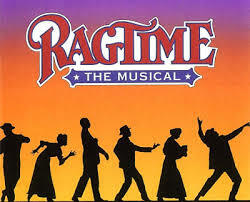 The opening number of the musical Ragtime musically and dramatically brilliantly sets up the dynamics of the story, introducing the three major population groups – upper class, African-American and Immigrant – that will define the narrative, all the lead characters who will dominate the plot as well as real-life historical characters who will influence events. After the seven minute mark all the various ethnic and social groups have been mixed up by Graciela Daniele’s brilliant musical staging; but they then recoil at this “melting” together back into their constituent groups, which then engage in a kind of trio dance off between three antagonistic mass organisms. This was a masterful moment of staging in the original Broadway production of Ragtime, a musical that is, as far as I can tell, only one of two artistically successful Broadway musical adaptations of sprawling historical epics (that world-wide phenomenon with the French title, you know the one, is the other). Unfortunately it was not a financial success. The year it opened (1998) it vied with The Lion King as the musical of the season, earning 13 nominations to The Lion King’s 11, and winning four, including for book and score (my favorite score of Stephen Flaherty and Lynn Ahrens, by the way) and Audra McDonald’s third Tony of her record six (and counting) but not Best Musical. That went to The Lion King, the other feline musical that will evidently be with us now and forever (no complaints here). 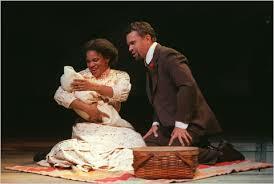 But Ragtime closed already in 2000, even though it was still playing to large audiences. It was just too expensive and allegedly not well financially managed by its main producer, to put it mildly (I don’t remember the full story, but it was one of those tales where lots of lawyers get involved and one uses the word “allegedly” a lot in writing about it). I will close this reminiscence of E. L. Doctorow and one of the better musicals of the ‘90s inspired by his most famous work, by sharing my favorite song from the musical Ragtime: “New Music”. This song unfolds as the rich upper middle class family listens to Coalhouse Walker, the black ragtime musician, play on their piano to entice his formerly spurned lover Sarah down from the room where she has taken refuge. It is a song about the power of music to express love, so perhaps it shouldn’t be surprising that I as a composer am particularly drawn to it. But the tender yearning expressed in the melody, particularly the B part that begins with “his fingers stroke those keys” speaks for itself, regardless of topic. That part will be played several times again on the piano throughout the show, haunting the drama. PS: If you wish to acquire the soundtrack of Ragtime – the Musical, I recommend getting the 2 CD complete recording. You get all the music and by hearing the full score you can also easily follow the whole plot. This entry was posted in Cinema Scope, Literary Lyricism, Live! On Stage, Melodies Linger On and tagged Audra McDonald, Billy Bathgate, Book, Brian Stokes Mitchell, E. L. Doctorow, epic, Graciela Daniele, history, Lynn Ahrens, movie, musical, novel, Ragtime, Stephen Flaherty, The Book of Daniel, Tony. Bookmark the permalink.